The internet has changed the way business is conducted in virtually every industry, and the construction industry is no different. Online plan rooms now provide construction firms with more information about projects than ever before and the capability to access that information quickly at any time of the day or night. With all of that information at one’s fingertips, it’s easy to become overwhelmed and lose track of what is most important. One of the tools Builders Exchange provides through the IPIN system is the ability to track the projects that are the most important to your company. 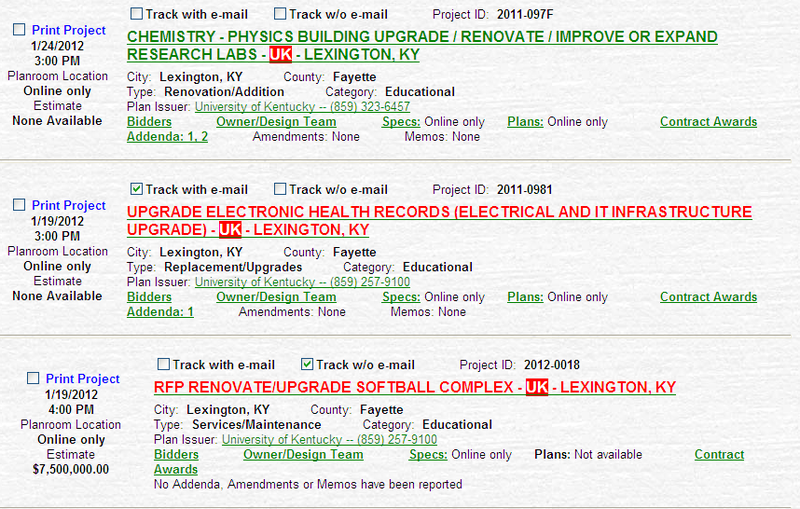 When searching for projects, reviewing filter results, or viewing project details, members have the option to add a check-mark in the box next to “Track With E-mail” or “Track w/o E-mail”. Checking either of these boxes will change the color of the name of the project to red and add it to your Tracked Projects list, which can be found underneath the list of filters by clicking on the My Projects icon at the top of every page, or by clicking on Tracked Projects & Filters from My Deskpad. Any project in any phase can be tracked, including Pre-Bid, Active, or Post-Bid projects. Tracking a project without e-mail will add the project to the Tracked Projects list without sending email updates. You can choose to delete a project from tracking by clicking on the red X on the My Projects page or by unchecking the “Track With E-mail” or “Track w/o E-mail” boxes anywhere they are found above the project title on the site. 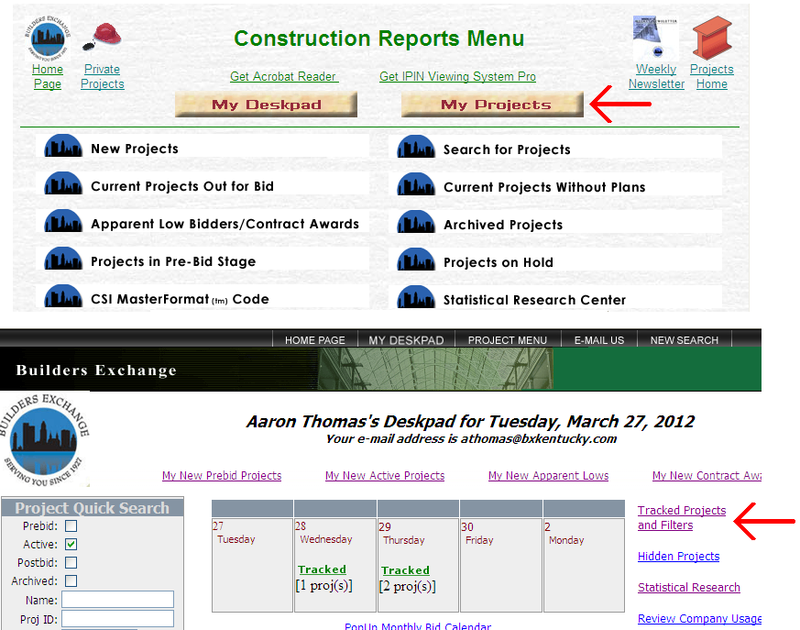 You can also switch from tracking a project with e-mail to without e-mail (and vice-versa) by clicking on the “Yes” or “No” to the right of each project on the My Projects screen (see picture above). 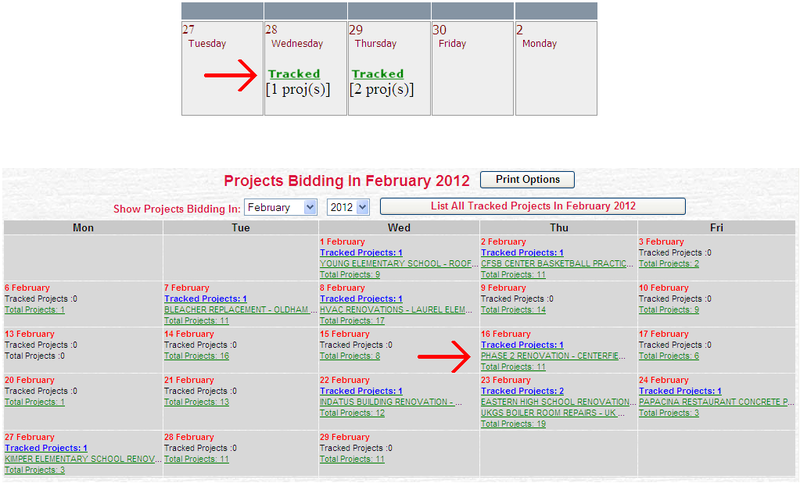 All tracked projects will also appear on the Weekly Calendar and the Pop-Up Monthly Calendar located on My Deskpad, keeping you aware of the upcoming bid dates for each project in which you are interested. Tracking a project with e-mail will do much more than keep the project in your tracked projects list: it will provide you with instant updates via e-mail on any new addenda, amendments, or memos that have been added to the project as well as any other major changes, such as bid date changes or when apparent lows and contract awards have been reported. 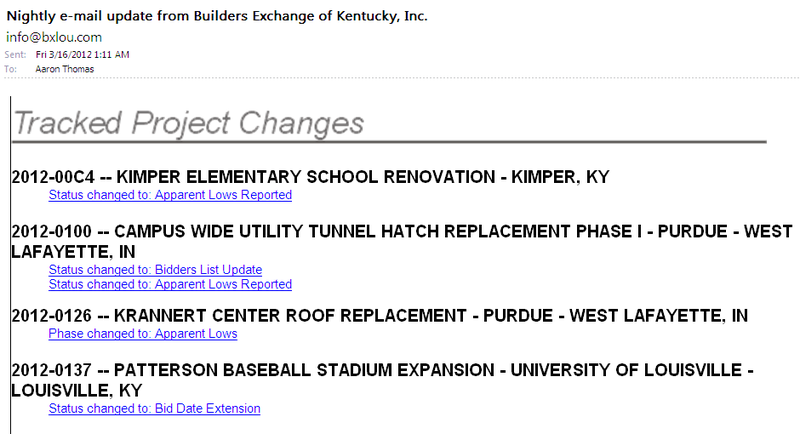 Finally, any new changes to tracked projects will show up in your Nightly E-mail Update, including bidders list updates, bid date changes, phase changes, and any new addenda. Tracking projects is the most efficient way to keep up-to-date on the projects you want to bid without getting bogged down by the projects you don’t. For more tips like this one, join us in Louisville on the third Friday of every month from 10-11:30 a.m. for free IPIN training at the Builders Exchange Center for Education & Training Excellence, 2300 Meadow Drive, Louisville, KY 40218 or at the same time on the fourth Friday of every month at our Lexington location, 1035 Strader Drive, Suite 100, Lexington, KY 40505. You can also join us for free online training on Thursday, April 19 from 10-11:30 a.m. The next training sessions will be held on April 20, 2012 (Louisville) and April 27, 2012 (Lexington). Call me, Aaron Thomas, at (502) 459-9800 or e-mail athomas@bxkentucky.com to RSVP for training, either online or in person! If you have any questions, comments, or suggestions for IPIN Tip of the Month, comment below or e-mail me at the address listed above.